The all-Wyoming version of the classic family-favorite board game is now available for sale at the Wyoming Historical Society and the City offices for $30. Proceeds from the game help fund the new Wyoming History Museum in the offices of the Historical Society at 800 Oak Avenue downstairs. Who needs Park Place or the B&O Railroad, when you can own the Reily House or the Water Tower? Get your own Wyoming-Opoly from the Wyoming Historical Society! You’ll recognize every landmark in this home-town version of Monopoly as you roll the dice and move your Cowboy-inspired game pieces – that include a doughboy replica, a train, and a horseshoe – around the board to land on spots like Wyoming Avenue or Ritchie Avenue. Draw a Turkey Raffle card (substituted for the Chance cards in the original Monopoly), and you may land behind bars for walking on the famous marble steps of the Middle School. Draw a Cowboy Card (substituted for Community Chest cards), and you could collect $50 for coming in first place at the July Fourth parade. Deed cards contain fun history facts – like the story of the American flag sewn by Wyoming women in 1861 that now hangs in City Council Chambers. 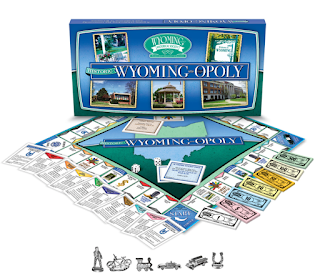 Filled with references to the people, places, and events that have made Wyoming unique, this game will make a great gift for anyone with fond memories of living in Wyoming, says Sherry Sheffield, past president of the Wyoming Historical Society. Each game includes a historic timeline of the City of Wyoming. Wyoming-Opoly was created by the Wyoming Historical Society in cooperation with Late for the Sky, a Cincinnati company that produces custom games based on the Monopoly game. Sales revenue supports the Wyoming History Museum, which was opened in the fall of 2017. The museum displays a concise history of the City of Wyoming and includes artifacts from early settlers and more recent residents, along with memorabilia from Wyoming High School. Wyoming-Opoly can be purchased with cash or check made out to Wyoming Historical Society. Games can also be mailed to any location in the continental U.S. for an additional $17, which covers the shipping box and postage. If you prefer to mail it yourself, shipping boxes are $2. Address questions to Sherry Sheffield of the Wyoming Historical Society, 513-821-5866.